In previous issues we’ve reviewed the dramatic shift to mobile computing among visitors to Boat Trader. For this issue we’ll take a multiyear view, by quarter, showing the rising proportion of those using smartphones and tablets. The chart at right also shows the total number of unique visitors and graphically demonstrates the seasonal rise and fall of Boat Trader visitors. Total visitors to Boat Trader increased in almost every quarter from 2011 to 2013, compared with the same quarter the previous year. The only exception was the second quarter of this year. The lowest total was about 3 million unique visitors in the fourth quarter of 2011 and the highest was in the third quarter of this year — nearly 7 million. Of note is that seasonal interest in the site normally peaks in the second quarter, but the third quarter was stronger this year. As the graphic shows, smartphone and tablet visits were relatively few in 2011, but they began to increase rapidly in 2012. 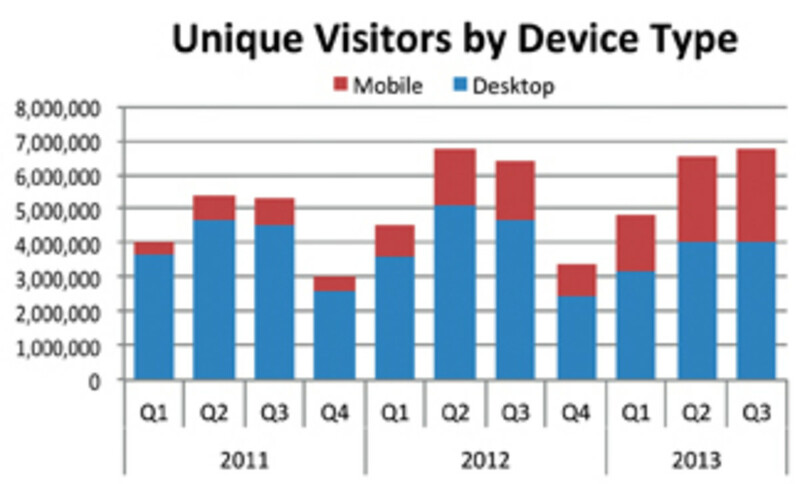 Desktop and laptop visitors also increased in 2012, but this year they began to drop year over year. In the third quarter mobile visitors topped 40 percent for the first time, and our analysts predict that those visitors will reach 50 percent by the middle of 2014.